An artist, curator, mentor and entrepreneur, Man One believes in the transformational power of art and its power to save lives and make the world a better place. Man One believes art gives mankind an essential and irreplaceable cultural language in which to express and know itself. Man One believes art can transcend cultural and socio-economic barriers, fostering understanding, mutual respect and unity among disparate peoples. Man One believes these things are possible because he's seen them happen through the power of his own art and the art of others. Growing up in Los Angeles, Man One developed his love for art, developing his skills as a graffiti artist on the streets of LA. He honed his talents as a fine artist and understanding of art history at Loyola Marymount University where he earned his Bachelor's Degree in Fine Arts. Over the years, Man One has worked with the U.S. Department of Health and Human Services’ Centers for Disease Control, The Mexican Consulate in the U.S., and most recently received a Speaker and Specialist Grant by the U.S. State Department to work with the U.S. Embassy in Panama. There he demonstrated to Panamanian children and teenagers how art could build self-esteem and self-respect to help you overcome any situation. In 2011, he was invited to North Ireland (twice) where he painted murals and conducted workshops to help foster understanding and mutual respect among young Irish Catholics and Protestants. He has led similar workshops in Japan, Germany, Mexico and throughout the United States. 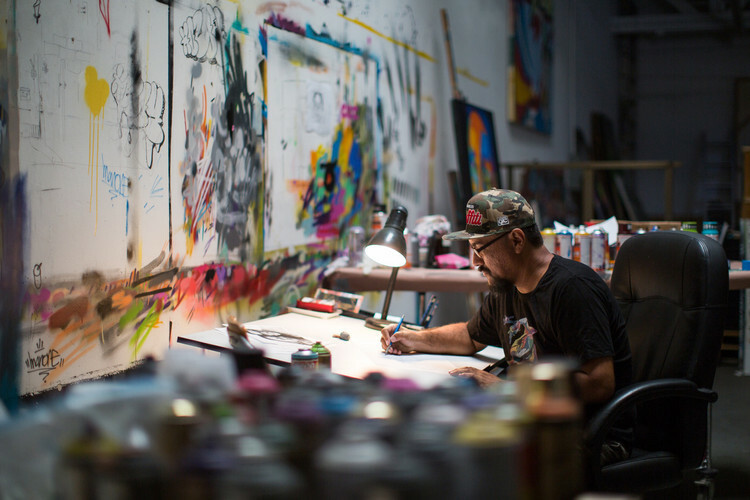 Man One's art is comprised of his trademark bold, colorful art strokes and has been featured in ten solo shows, countless group exhibitions, and curated well over a hundred. His work has been exhibited in many museums including the Museum of Contemporary Art in Los Angeles, The Getty, Pasadena Museum of California Art, LACMA, Orange County Center for Contemporary Art in Santa Ana, Pacific Asia Museum in Pasadena, Parco Museum in Tokyo and the Smithsonian Institute in Washington D.C. His artwork is collected internationally and has shown in galleries around the world including Australia, Germany, New Zealand, Mexico, UK, Japan, and Switzerland among others. In 2002, Man One founded Crewest Gallery in Los Angeles to legitimize graffiti art as a valuable and collectible art form and give graffiti artists a professional venue and forum in which to showcase their work. In the book, Graffiti L.A., street art documentarian Steve Grody listed the opening of Crewest Gallery as a milestone event in the history of graffiti art in Los Angeles. Ten years on, Crewest continues to be a leader in the world of collectible graffiti art. Man One and his art have been featured in many television shows such as MTV’s Pimp My Ride, ABC’s Extreme Makeover: Home Edition, America’s Next Top Model, and The Contender to name a few. On the silver screen he has appeared in John Tucker Must Die (Revolution Studios), The Roommate (Screen Gems), Burn Hollywood Burn (Cinergi) and featured in television commercials for Ford, Microsoft, Target and Verizon. He has painted live on stage at some of the largest U.S. music concerts and festivals including tours for MTV with The Black Eyed Peas, De La Soul and Wyclef Jean as well as traveling across the country on the Van’s Warped Tour performing side by side with bands like 311, Blink182, and Good Charlotte. He has performed with music legends like George Clinton and Parliament-Funkadelic. Man One has been commissioned commercially by a plethora of corporations including Coca-Cola, Disney, Bristol-Myers Squibb, Carmax, Oakley, Dickies Girl, Pioneer, Symantec, EA Sports and Ubisoft to name a few. Man One has been recognized for his unwavering support for many charitable causes, donating his time and talents painting and teaching art on behalf of The HeArt Project, I Am Angel Foundation, The Center for Biological Diversity, and Heal the Bay. In 2009, The HeArt Project selected Man One as the recipient of that year’s Artist award for his significant contributions to their important cause of arts education among underprivileged youth in Los Angeles. He was also acknowledged, with a RIVIE award, for artist of the year in 2008 by the Friends of the Los Angeles River. Man One's artwork has been profiled and featured in a number of international magazines, newspapers and books including The L.A. Times, The Washington Post, New York Magazine, Warp Magazine (Japan), Angeleno (USA), 38Times (Japan), Lowrider Arte Magazine (USA), Rime Magazine (USA), La Dolce Vita (Italy), Aelle (Italy), Backspin (Germany), Rap Pages (USA), “Graffiti World” (by Nicholas Ganz), “Painting the Towns: California Murals” (by Jim Prigoff and Robin Dunitz), “Graffiti L.A.” (by Steve Grody) and is mentioned in “The History of American Graffiti” (by Roger Gastman and Caleb Neelon). Man One's life work is about putting the power of art in the hands, hearts and minds of people all over the world. Everything Man One has done to date is about democratizing art and educating others about the unique value of graffiti art. Moving forward, Man One will continue his life's work as an artist, teacher and entrepreneur in order to empower mankind and facilitate a more beautiful, fair and just world through the power of art.